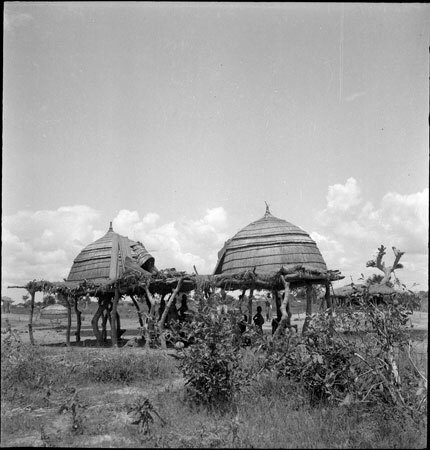 Two dry season shelters belonging to an Agar Dinka family raised on a joined platform, known as hon-nhial (upper house) or aduel. They are roofed with several layers of mats, which can presumably be taken off and stored in the wet season village. Members of the family are visible in the shade beneath the platform, and a cattle byre is just visible to the right of frame. Morton, Chris. "Agar Dinka shelters" Southern Sudan Project (in development). 03 Jan. 2006. Pitt Rivers Museum. <http://southernsudan.prm.ox.ac.uk/details/2005.51.112.1/>.